Welcome to Auto Cool Radiator, the premier service provider for your car, truck, van or SUV's radiator, condenser, heater core and automotive air conditioning parts. Auto Cool Radiator specializes in . . . Since 1977, Auto Cool Radiator Auto Cool Radiator in Hackensack, New Jersey, has the highest quality cooling and heating solutions in northern New Jersey at the most competitive rates! Your local source for radiator, heating, and auto air conditioning service and maintenance. Years of providing quality service have made Auto Cool Radiator a proven leader in the industry with experience, competitive rates and ASE certified technicians who have the skill and training necessary to properly maintain your car, truck, van or SUV. Auto Cool Radiator can also repair and re-core radiators for older model cars, antiques and classic cars! Auto Cool Radiator stocks over 800 new radiators in its Hackensack warehouse! The role your radiator plays in your vehicle's operation is to keep coolant flowing throughout your engine. If at any point a block or a leak occurs, your engine can quickly overheat and eventually break down. 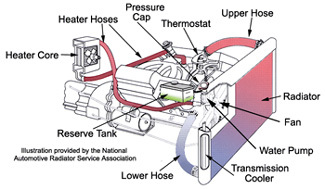 Coolant leaks are often caused by cracked or ill-fitting hoses or perhaps even a hole in the radiator itself. Radiator metal itself is thin and easily damaged. Even with that, the number one cause of coolant leaks is corrosion, which can be easily prevented by routine maintenance. Visit the professionals at Auto Cool Radiator at least once a year to keep your heating and coolant systems in optimal condition for peak performance! Auto Cool Radiator is here to answer your questions and assist you with a variety of automotive services to insure your peace of mind and comfort while driving. Stop in today for your car or truck's heating and cooling check-up!